Wash the zucchini and cut it to a little more than byte size pieces – the zucchini will shrink in the process of cooking. Peel the potatoes and cut them the same size as zucchini. Put the potatoes in a cooking pot and pour in the water and season with salt. The water should just cover the potatoes. Cook for about 20 minutes. Take a large roasting pan, put it on high heat and pour in the olive oil. Add the zucchini and stir fry for about 5 minutes on high heat. Don’t lower the heat, but toss the whole time. 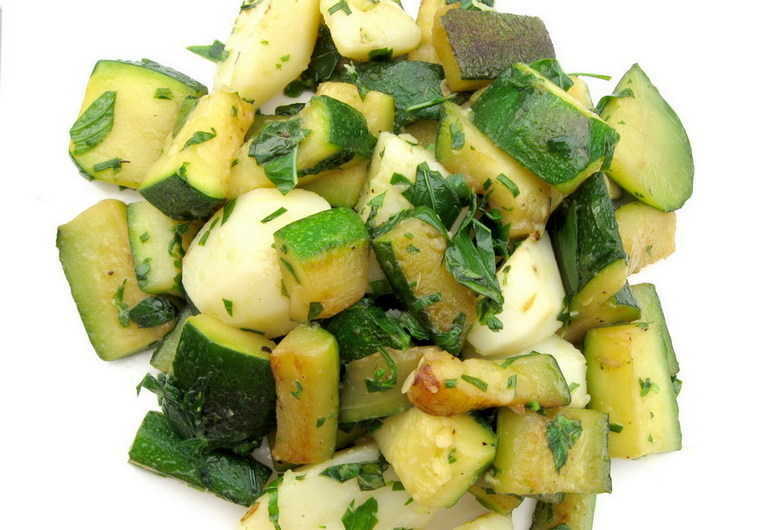 A minute before zucchini is done add cooked potatoes, season with salt and pepper and add fresh herbs. Stir fry for another minute and serve.